When planning a visit to New York City, many tourists talk about visiting sites like the Empire State Building, Rockefeller Center, or the Statue of Liberty. Or, horror of all horrors, Time Square. If you're visiting NYC with a toddler, I suggest you throw out the list of standard guidebook "must-sees" and get more creative with your trip planning. Though NYC can be a fast-paced city, you can still have a memorable - and relaxing - time with your little ones if you pace yourselves, visit neighborhood populated with young kids, and find ways to balance parents' and little one's idea of a good time. Here are parents' top suggestions for how to navigate a trip to NYC. *I* get overwhelmed sometimes by the hustle and bustle of Manhattan. Imagine your toddler. How well will they do with crowds, lots of noise, flashing lights, endless cab rides in traffic, and oversized M&M characters in their face? I'm going to guess that you can kiss nap time goodbye. In which case, reconsider your visit to the Statue of Liberty, Empire State Building, Time Square or other Midtown destinations. Little ones are not their best selves when faced with lines, crowds, and overstimulation. No one is going to have a great time with a melting down toddler. Giving your little ones some relative quiet (yes, that does exist in New York), space to run around, and easy access to kid friendly amenities and activities will make your days run a lot smoother. Rather than building a list of sites to visit, identify neighborhoods with a large number of young families, and build your itinerary from there. These neighborhoods are often flush with leafy streets, fun playgrounds, and toddler and baby-friendly restaurants and activities that are also a hit with parents. The Littlest Passport recently created two itineraries for families to explore a mind-blowing urban park with breathtaking views of the Manhattan skyline, thought-provoking art, a fun children's bookstore, great coffee, and delicious food - all in the beautiful stroller mecca of south Brooklyn. Other great neighborhoods for little ones are Battery City Park, Upper West Side and Harlem, though the options are truly endless. To explore and experience NYC like a local, check out Babyccino, a great lifestyle website for modern moms that has curated a number of fun things to do, see and shop in top toddler neighborhoods throughout New York. There are so many fun things to see and do in NYC. It can be tempting to want to cram in as much as possible. But you'll never see all the attractions in one visit, and your toddler will lose interest and get crabby without some down time. 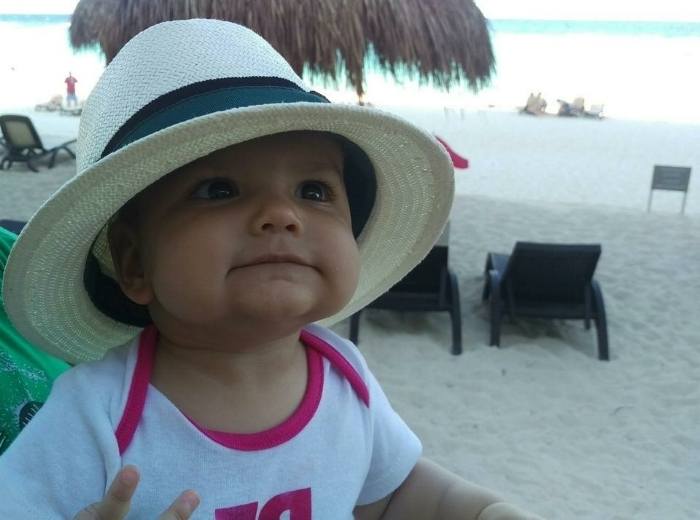 Be sure to leave plenty of down time for toddlers to release and refuel their energy by hitting a playground or your hotel’s pool (great advice echoed by this NYTimes article about traveling with kids). My daughter is usually slow to get going and a bit of a homebody post-nap. I know this, and keep our plans almost non-existent in the afternoon, even when traveling. I love hotel pools for that reason - kid's love them and you don't need to schlep far. 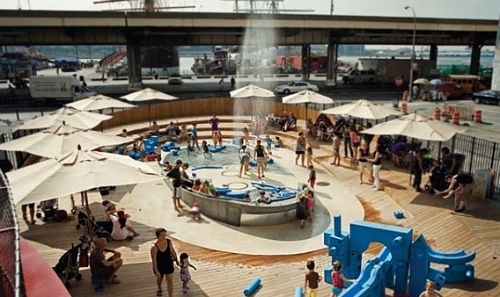 Playgrounds are a great option too, and NYC's are second to none - the best are likely to delight even us adults, like Brooklyn Bridge Park, Pier 25 playground along the Hudson River, Imagination Playground in Lower Manhattan, and Hippo Playground on the Upper West Side. And as the NYTimes points out, at playgrounds "you’re likely to meet local parents who can advise you on other activities for your toddler in town and also tell you names of kid-friendly restaurants to dine at". In the vein of not getting too ambitious, stick to exploring one neighborhood or area of NYC each day with your toddler, which will limit cab rides and subway trips. Although the subway lines are extensive in NYC, many subway stations do not have elevators, which means that you'll be carting strollers and toddlers up and down multiple flights of subway stairs with each trip. (That said, New Yorkers with kids are often sympathetic and willing to offer a hand). Rush hour means packed subway cars and traffic congestion, so you'll want to make it back to your accommodations by mid-afternoon on weekdays. Late afternoons on the weekend can also be busy on subways, as people return home from an afternoon of brunching or shopping. So plan to stay local in the afternoons, exploring sites, cafes, or playgrounds close to where you're staying (or the hotel pool)! When all is said and done, when you've stood in line at the "must see" NYC attractions, handed over your hard earned cash, and seen the site/view/statue, you may realize it wasn't all that exciting. My hair dresser said something to me just weeks after I'd moved to NYC, which has always stuck with me. "People who are the best at what they do move to New York". And it's true. I'm not saying that NYC is, or should be, the center of the universe. But I am saying that anything you are passionate about, anything that you secretly always wanted to be, well, you'll probably find some of the best of that thing in NYC. Love yoga? You'll find fabulous, big name teachers in the city, whose class you can attend. Are you a bookworm? There are fantastic bookstores that you could explore row by row for hours, as well as amazing published authors making appearances daily around the city. So all I'm asking you is, given the choice, while in the mecca of awesomeness, do you want to experience some of that awesomeness first hand, or do you want to go see a building or monument that someone tells you to go see? And yes, I didn't forget that you have a toddler. The Littlest Passport believes that you can balance your child's attention span, interests and needs with your own passions and interests. 1) If you and your partner share the same interest, consider bringing extended family along on your trip to look after your little one for an afternoon, or hire a babysitter for a couple of hours. If your hotel has a concierge, they can probably recommend a babysitting service. 2) Of course, if your child has separation anxiety (clears throat, raises hand), hiring a babysitter might not be possible. But don't give up! Consider finding a toddler-friendly activity that aligns with the thing you love. After all, this is NYC, home of kids' club scene. 3) Split childcare duties with your partner. Scout out great playgrounds, great coffee and delicious snacks in the vicinity of your desired activity. Then you go explore your passion, while your partner entertains the kid (with a delicious cup of joe in hand). Have an activity in mind for the whole family for after you're finished with your solo time. It'll be easier for your toddler to accept that you are leaving for a little while if they know there's fun in store upon your return. Traveling to NYC with a toddler? The Littlest Passport is launching a series of NYC itineraries that invite you to connect with your passions, while ensuring your toddler also has a blast, so keep an eye out for new NYC itineraries in the coming months. Our first, about Brooklyn Bridge Park and DUMBO, and the Brooklyn Museum and Park Slope, are already posted. And you want help connecting with your passions and planning a 2-3 hour NYC itinerary that aligns with your passions, reach out!